The research achievements of La Trobe University academics working in Asian societies and partnerships was presented today at the La Trobe Asia Research Showcase. Academics, including myself, presented our research projects which have been supported by the La Trobe Asia grant program, from range of disciplines including politics and sociological studies through to health issues and biomedical sciences. 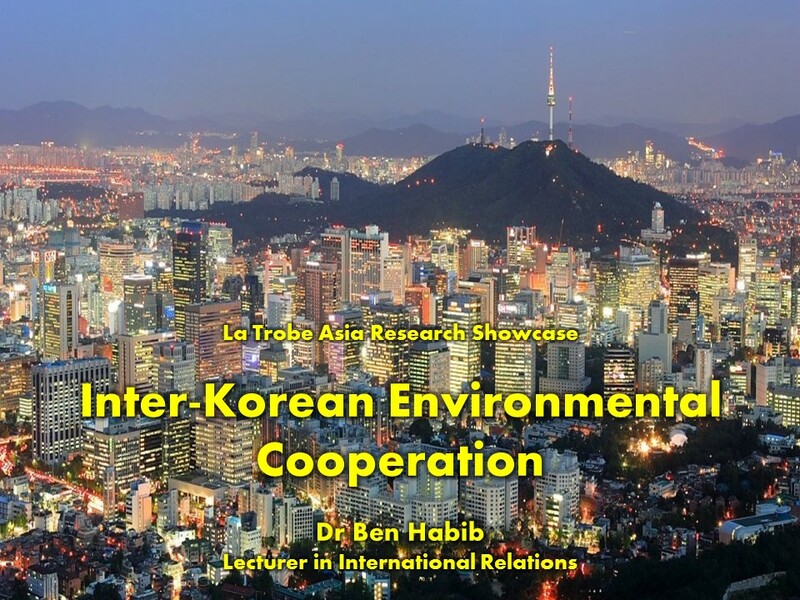 In my presentation, I discussed the findings of my field research earlier this year in Seoul investigating inter-­Korean environmental engagement. This research found that general reticence within the ruling conservative party in South Korea over engagement with the North continues to limit expansion of environmental cooperation programs across the DMZ, in spite of the potential of environmental cooperation as a relatively de-politicised option for engagement and confidence-building. A special thank you to Professor Nick Bisley, Diana Heatherich and Matt Smith from La Trobe Asia for organising the Research Showcase event, in addition to their ongoing support for my work. Thanks go to my colleagues for sharing their outstanding research projects. A warm note of thanks also go to the Institute for Far Eastern Studies at Kyungnam University for hosting me during my visit to Seoul. That was interesting to hear. Is this a forum for academic researchers to socialise their work or is it something that you have initiated for your LTU colleagues? Who generally make up the audience? This event was organised by La Trobe Asia, which is a body within LTU devoted to facilitating research, teaching and engagement links between LTU academics and partners across Asia. Presenters at the research showcase were all recipients of grants from La Trobe Asia to further our research.